So, I didn't need it... but how could I resist? As it transpired, I forgot to get any extra cash and so only had the amount I had in my coin tray in the car - I use this for the parking meters normally so I better restock it! First up, above, a cotton fabric that is actually more khaki than the grey it appears above. It was .50c and is enough for a pair of casual trousers or maybe jeans. This viscose (rayon) above matches perfectly and $6 for 1.25 metres of 140cm wide is a good buy particularly when it is a lovely print. This should become a top to match those pants I'll make (cough, cough) above. This a a beautiful piece of linen that is a beautiful watermelon red colour. Dress or drawstring pants? $2? could you resist?? 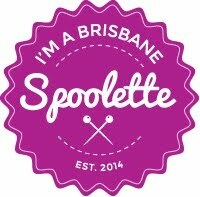 Hi... just a reminder of the fabric sale this Thursday and Friday if you live around the Brisbane and surrounds. Ottobre and Burda - a nice couple. This is my latest sewing. Sorry it's so crumpled.. I've been out all day and also did some house jobs before thinking about photos. I had planned to take them while I was out, but of course I forgot my phone today so I used my real camera. I think they are better although the colours aren't perfect. Finally something my $5 pink plastic watch matches! I had shoes on but ditched them when I got home for my trusty Birkis! Introducing my overgrown garden made worse by the heavy rain last week. It's on again.... The Fabric Sale! Brisbane Frocktails .... it all worked out in the end!